LeoSat Enterprises, which is launching a constellation of LEO communications satellites, has entered into an agreement with Hispasat, the Spanish national satellite operator, to invest in LeoSat, — with this agreement, Hispasat joins Asia’s largest satellite operator SKY Perfect JSAT in the growing trend for satellite operators to future-proof their communications solutions through the development of LEO capabilities. Big Data is driving the need for new communications infrastructure. Data volumes are exploding, with more data created in the past 2 years that in the entire history of the human race. Global networks are already carrying more than 1 Zeta Byte of traffic globally and this is forecast to grow exponentially. This will have a lasting effect on the communications industry, with the need to invest in and deploy appropriate infrastructure, particularly with satellite communications, whose data market will grow with the deployment of low earth orbit solutions that will enable telecom and satellite operators to complement their current portfolio with suitable capabilities for future demand. Artistic rendition of the LEOSAT constellation. Image is courtesy of Thales Alenia Space. Hispasat has achieved continuous growth and, with this investment in LeoSat, the company finds a perfect complement for their geostationary fleet and expands the firm' scope significantly towards new verticals that will define the data market over the next years. The investment in LeoSat underlines their firm belief in the unique attributes of LeoSat’s new LEO network architecture to ensure further growth in the future. With the ever-increasing demand to move large quantities of data quickly and securely around the world there is a growing interest in the major performance advantages of communications networks in LEO. 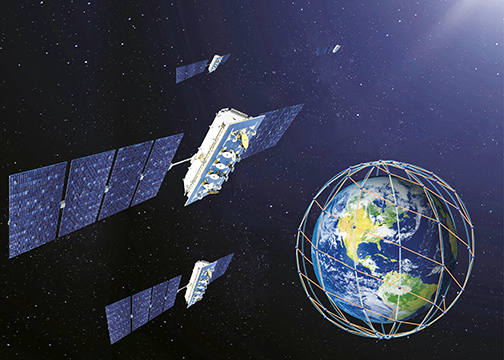 The unique features of LeoSat’s system — ubiquity, low-latency, speed and cybersecurity — are ideal for a number of applications, such as to enabling global 4G and 5G satellite connectivity for cellular operators, providing the bandwidth required for energy, maritime or financial sector operations, delivering secure networks for government and defense communications, ensuring critical emergency communications and enabling Internet access and connectivity for remote communities. With Hispasat now joining SKY Perfect JSAT, both companies will work with LeoSat to accelerate a number of key activities including, vendor selections for customer premise equipment and ground operations, as well as further optimization of the satellite platform. The partnership will also enable LeoSat to leverage both the commercial and regulatory expertise of these two well-established operators. Mark Rigolle, CEO of LeoSat said that the company is delighted that Hispasat, with its reputation for quality, efficiency and reliability and its strong presence in Europe, North Africa and Latin America, has chosen to invest in LeoSat to expand its network capabilities. ’Always-on‘ connectivity, increasing digitization and the move to cloud-based operations and smart data analysis and management, all require resilient and future-proof networks to deliver connectivity and services. Whlie the perception of satellite for data communications is often seen as a last resort, LeoSat will change that by pairing the speed of fiber with the ubiquity of satellite and adding a new dimension of ultra-security. Hispasat recognizes that we will not only bring a paradigm shift in expanding the existing satellite services market, we will open up new markets for space-based data networking for telecoms, tech and media across the globe. Carlos Espinós, CEO of Hispasat, added that with the current and future growth of data traffic, the company notes the strategic importance of investing in new infrastructure to enable existing and future customers to substantially increase their communications capabilities. LeoSat has distinguishing features from the other constellations that makes it especially interesting: high capacity, low latency, high security and a meshed network that simplifies its architecture. LeoSat’s system design, combining satellite and networking technology to provide a network in space, is a departure from existing solutions today and we see this as a key opportunity for us to open-up new markets and deliver business growth. This investment in LeoSat demonstrates our belief that there will be very strong demand for LeoSat as it is the best solution to address the Enterprise market. This investment will allow Hispasat to strengthen and expand our existing GEO satellite services and position the company at the forefront of the new digital infrastructure. In addition, Hispasat and SKY Perfect JSAT have a relationship of complementary, understanding and mutual trust that will ease our joint leadership in this initiative. Koki Koyama, Senior Managing Executive Officer of SKY Perfect JSAT commented that this is an exciting time and the firm is delighted to welcome Hispasat on board LeoSat, which will provide the first enterprise-grade, extremely high speed and secure data service worldwide. Both SKY Perfect JSAT and Hispasat will support LeoSat in ensuring the successful launch of this unique new next-generation network.